RV maintenance is not always the most fun way to spend your time - but ignoring the following maintenance items could end up costing you a lot in unforeseen expenses and ruined vacations. Here are some tips to keep your RV ready to go when you are! A lot of customers forget that their lead-acid battery requires periodic maintenance. We get asked all the time to test batteries, and more often than not, they are completely dry. Lead acid batteries have caps on each cell that can be removed to see water levels. Each cell should have distilled water added so that it just covers the top of the plates. Filling them too full will prevent them from charging. How often will your batteries need to be filled? That depends on the type of charging system you have in your coach, are you using solar, etc. It’s a good idea to check the fluid levels regularly until you are familiar with how your charging system operates. 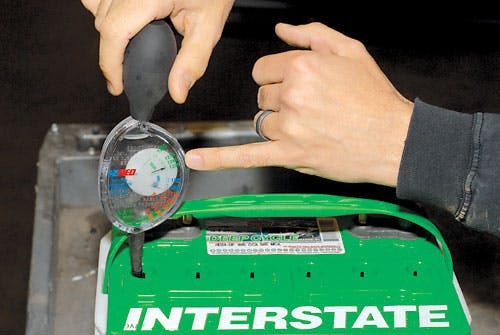 If you find you are filling batteries often, your charging system may be overcharging the batteries. Your RV should have a gas leak test done annually to ensure there are no leaks. This is an inexpensive test to have done and one of the most important in regards to safety. A lot of clients ask “shouldn’t my propane detector catch a leak”? It should, but they often don’t realize that LP detectors should be replaced every 5 years. Your detector will have a date stamped on it (usually on the back) that will tell you if it is due for replacement. RV bearings should be repacked annually or 10,000 km, whichever comes first. 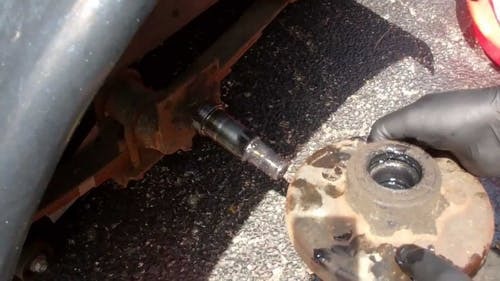 Bearing grease will break down over time and running an RV bearing without proper lubrication could cause a bearing seizure and potential damage to the spindle. Most shops will do an undercarriage inspection at the same time as a repack, which will include the other components – brake shoes, magnets, pins & bushings, leaf springs, etc. Having this inspection done regularly will prevent costly, unforeseen repairs. I’m saving the most important for last. I see dozens of trailers every year where the owner says “We had a leak that just started this spring, we have never seen water in our trailer until recently”. Generally speaking, if there is water staining happening in the coach, the leak has been happening for a long time. (There are a few exceptions to this rule). Exterior sealant will crack a small amount every year, even when the trailer is new. At a minimum, sealant should be inspected every year, although every spring and fall is even better. Any cracking should be touched up. And don’t just look at the roof! Inspect doors, windows, moldings and all other wall fixtures for sealant cracking too. Talk to your dealer about the proper sealants to use on your RV – some types of sealants won’t adhere properly, and can even cause damage to rubber roof membranes. RVs will last a long time as long as water is kept out of them – so protect your investment! Feel free to contact our service department if you have any questions about any of the items listed above!